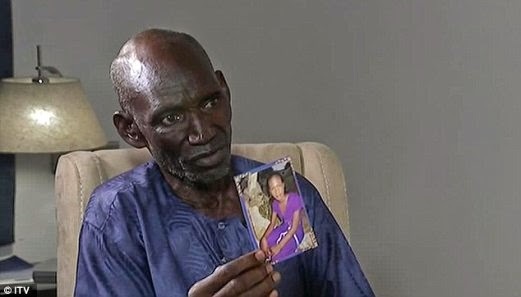 The father of a kidnapped Nigerian schoolgirl has revealed photographs of his daughter before she was snatched by blood-crazed Boko Haram fanatics. Mary was taken alongside her closest friend who lives next door to her. Speaking to ITV News, Mary’s father said he is desperate with worry and the thought of what his daughter is going through. Five of his nieces have also been snatched by the militant group Boko Haram which is holding 276 female students. This week it released a video showing around 100 of the girls and said they will only be freed after the government releases jailed militants. Mary’s father was shown the video in the hope he may recognise his own child or nieces. Despite not seeing his own daughter he did recognise a girl, he believes to be around 16 or 17, who lives opposite to his family’s home. He told ITV News that he did not trust the offer made by Boko Haram to release the girls in exchange for prisoners. The group, which wants to impose Islamic law on Nigeria, has killed more than 1,500 people this year in a campaign of bombings and massacres.